Hey there! Are you planning to be in the Wells Library sometime between April 3 and June 14? If so, why not stop by our exhibit currently on display in the Scholars Commons? 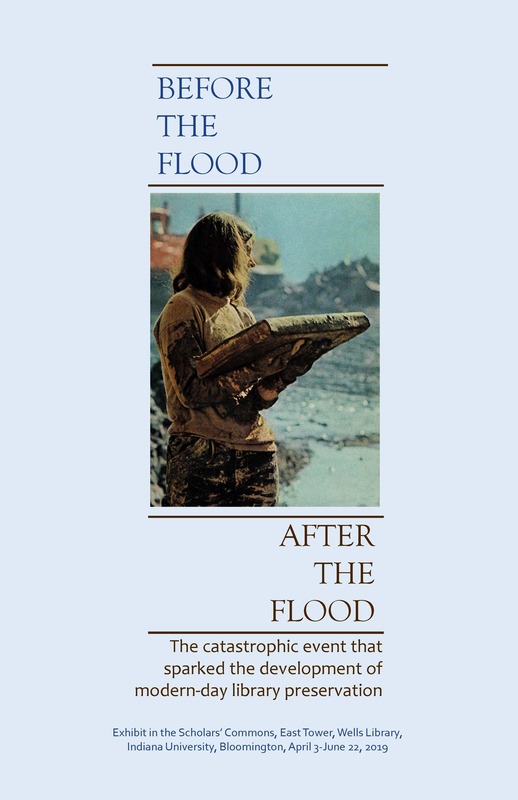 The exhibit is all about the professionalization of library preservation, and one of the biggest catalysts for this was the Florence Flood of 1966. The exhibit has all kinds of information about this and other pivotal events in preservation history, as well as some super interesting displays of past, present, and (possibly) future preservation tools and techniques! Unfortunately we can’t possibly include all the information we’d like to into one single exhibit, so I’d like to take the opportunity on this blog to expand a little bit on the Florence Flood. Buckle up, this is a long one! We begin our story in Florence, Italy; heart of the Renaissance, birthplace of Botticelli, Dante, and Leonardo da Vinci. Nestled in the gently rolling hills and famous vineyards of Tuscany, Florence was built straddling the Arno River, so they are used to the occasional deluge. However, in the early morning hours of November 4, 1966, the Arno River quietly slipped the confines of its banks and swept in to the city with a fury never before seen in the modern era. The last time the city had flooded to such a degree was 1557 CE, some 400 years earlier, and even then the waters were only half as high. The city was utterly unprepared for a disaster of this magnitude and could only watch as the waters, carrying mud, oil, debris, and sewage, roared through the streets and alleys. Thirty-five people lost their lives in Florence that day. As the flood waters receded, the shell-shocked Florentines were faced with a crisis of almost unimaginable magnitude. Not only was the structural damage to the city immense, but the amount of cultural heritage at risk was daunting. Books, carvings, paintings, sculptures, all these things were currently sitting under piles of mud and debris. 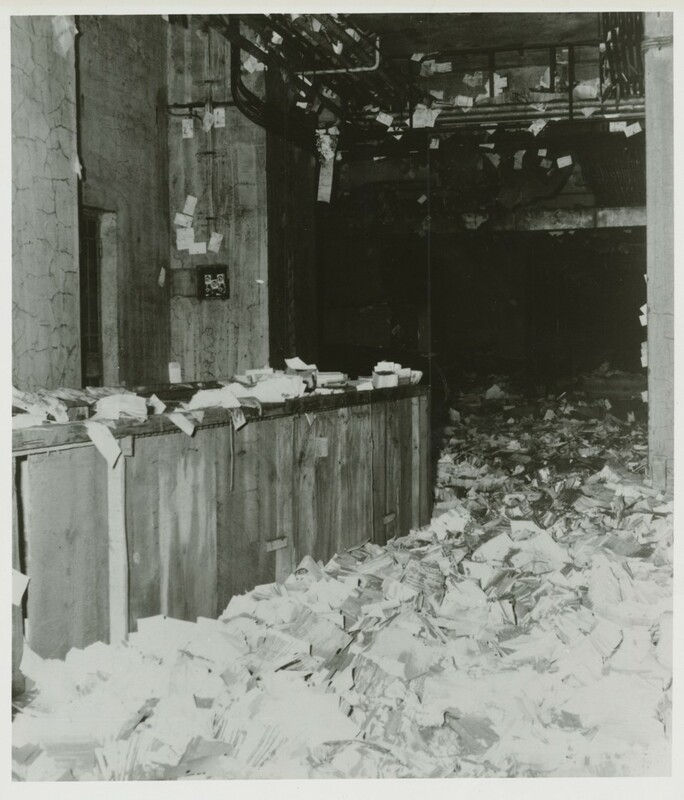 Nearly every library in the city was affected; private, public, and personal. 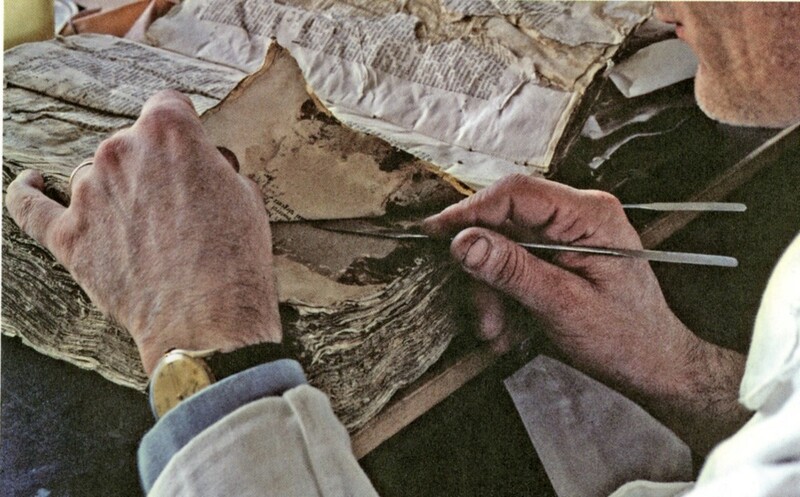 In the collections of the Archives of the Opera del Duomo, 6,000 volumes of documents were damaged, along with 55 richly illuminated choral codices, representing the sacred music used in the Cathedral of Santa Maria del Fiore for the last six centuries. 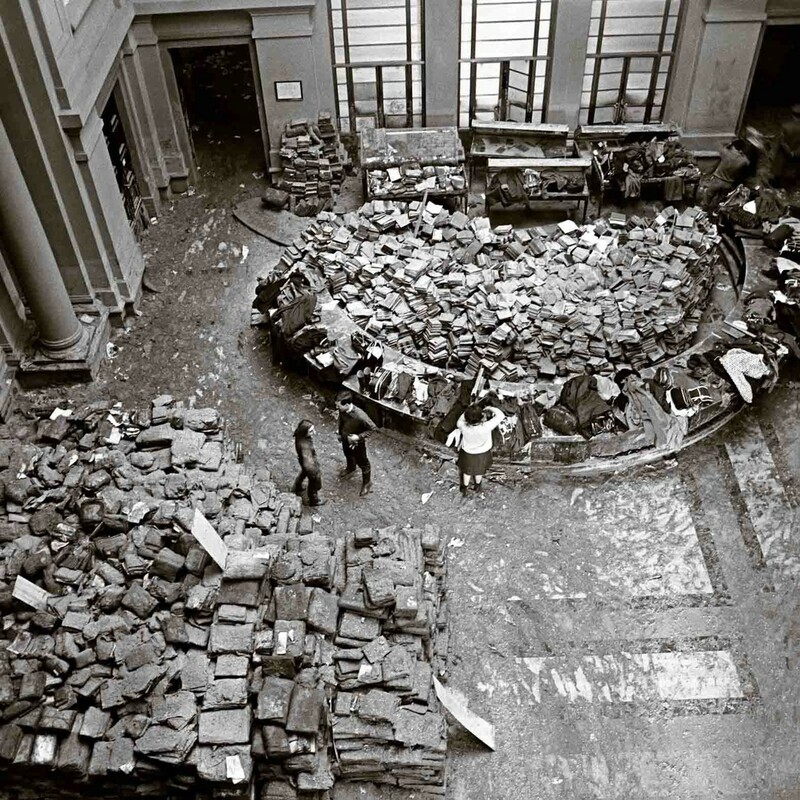 In the Gabinetto Vieusseux Library, all 250,000 volumes held at the time were damaged. In the Florence State Archives, which contain records dating all the way back to 726 CE, 40% of the holdings suffered damage of some kind. The most well-known victim was the National Central Library of Florence, which is the largest library in Italy and one of the most important in all Europe. It was founded in 1714, when a scholar named Antonio Magliabechi donated his 33,000 volume collection to the state. In 1743, it was required that a copy of every work published in Tuscany be submitted to the library. Since 1870, the library has collected a copy of every work published in Italy. Approximately 1/3 of all the library’s holdings (about 1,300,000 items) were damaged in the flood, most notably valuable items from the Magliabechi and Palatine collections. This library is where the subsequent conservation efforts would be concentrated. Then-director of the library, Emanuele Casamassima, rushed there as soon as he could to find books and papers buried in several feet of mud, with pages still stuck to the ceiling from where the flood waters had peaked. It was obvious that the first thing that needed to be done was to dig up as much as possible, as quickly as possible. 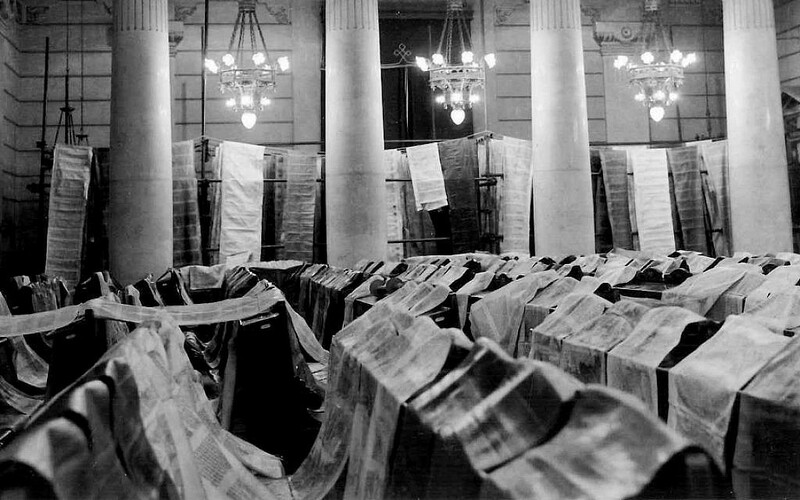 View of damaged books inside the Biblioteca Nazionale, photographer unknown. Casamassima issued a call for help, and students from universities all around Florence rushed to respond. They formed long human chains to pull books and manuscripts out of the mud, working tirelessly, paying no attention to the muck and filth they were surrounded by. 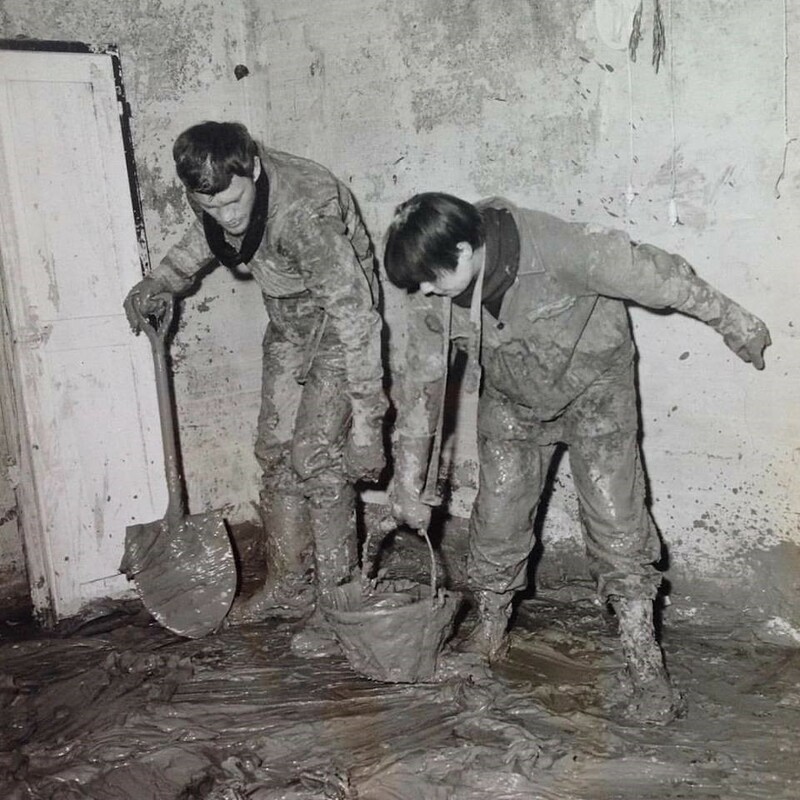 The grateful Florentines called them“mud angels.” Some of the items were covered in sewage and oil from burst pipes. These were rinsed and disinfected as well as possible. Although their efforts were well-meaning, some of the steps they took resulted in further damage to the items. Sawdust was spread around to soak up moisture, but was difficult to remove later on. 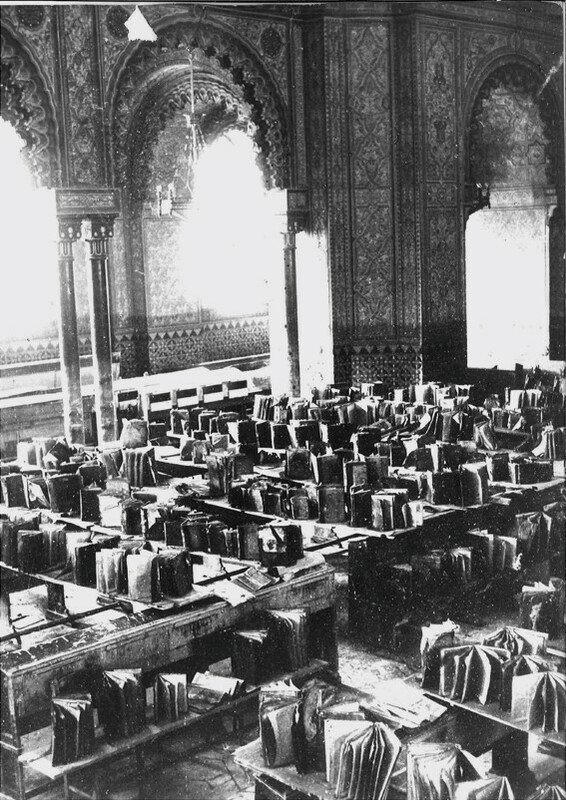 Books were placed in tobacco barns, brick furnaces, and textile mills to dry out, which unfortunately resulted in them being singed and cockled. As the rest of the world began to hear about the tragic losses facing Florence, adventurous students from around the world rushed to the city to help. It quickly became apparent that there was simply too much work for Italian conservators to tackle on their own, even with the help of the students. With help from the Council of Library Resources and the Imperial College, London, British conservator Peter Waters assembled a team and headed to Florence. He would go onto to spend two years there, overseeing conservation efforts, designing new treatments, and training a new generation of conservators. Help quickly arrived from every corner of the globe, Czechoslovakia, Denmark, Ethiopia, Germany, Ghana, Holland, Hungary, Poland, and Britain. 144 workers arrived in the first 6 months. Restoration stations were set up both in the library and in the Santa Maria Novella railway station. Peter Waters was responsible for the organization of the cleanup effort. He began by devising a nine-step plan. This idea of phased conservation, treating things in stages, would eventually be adopted by many libraries and is now a pivotal principle of our work. Books were selected, then a card was filled out detailing treatment needed (with so many languages being spoken, the cards used symbols for ease of understanding). Books were photographed. The photos would travel with the book through the entire restoration process and would be kept and filed at the end of it all. The text blocks were pulled apart into signature or loose pages. The pages were then collated and verified and the covers were removed. The covers would be reused if at all possible. Waters, S. (2016). Waters rising : Letters from Florence. Ann Arbor, Michigan : The Legacy Press. p. 406. Photo: Peter Waters. Waters, S. (2016). Waters rising : Letters from Florence. Ann Arbor, Michigan : The Legacy Press. p. 419. Photo: Peter Waters. If needed, books were washed and disinfected. Waters, S. (2016). Waters rising : Letters from Florence. Ann Arbor, Michigan : The Legacy Press. p. 407. Photo: Peter Waters. If needed, books were deacidified and buffered. 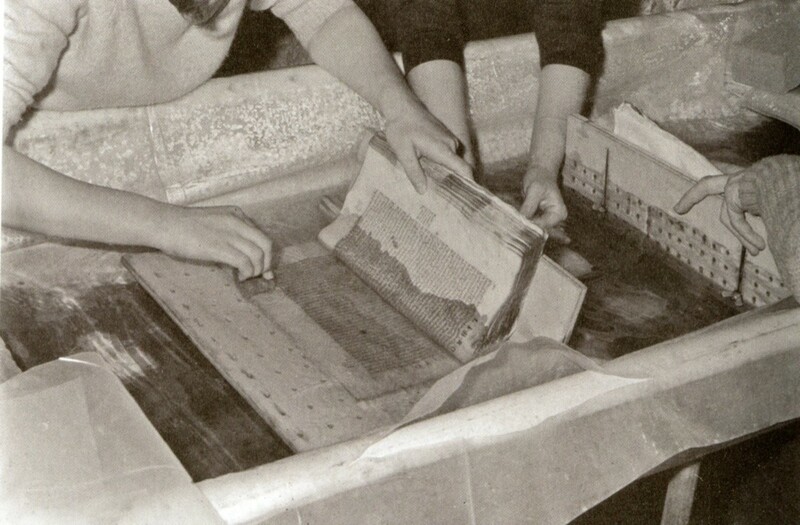 The text-blocks were then pressed to remove the water and flatten the pages. 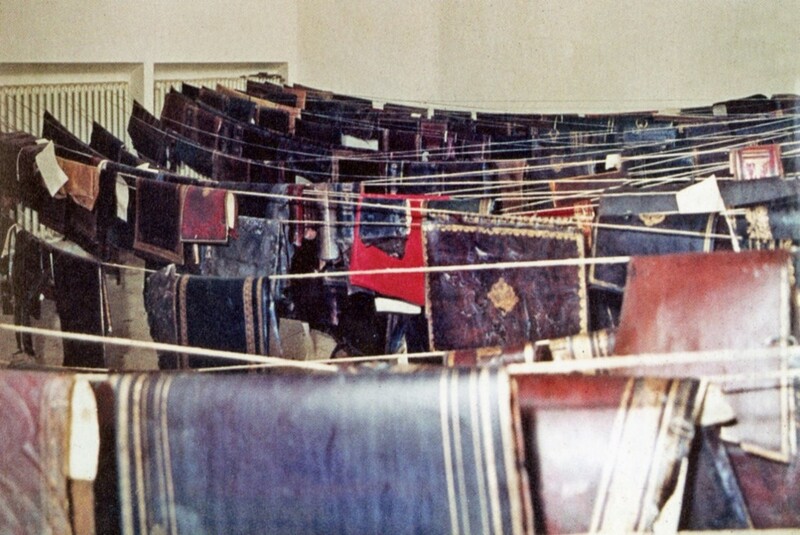 The books were dried in specially-designed drying cabinets. The pages were mended and the signatures were resewn. Lastly, the items were wrapped in anti-microbial paper, then sent to the binding area, where they were bound in as close to their original structure as possible. Although the flood was undoubtedly a disaster, there was a lot of good that resulted from it. Simply by bringing conservators from all over the world together in one spot, the Florence flood acted as a catalyst for the professionalization of the field of library preservation. 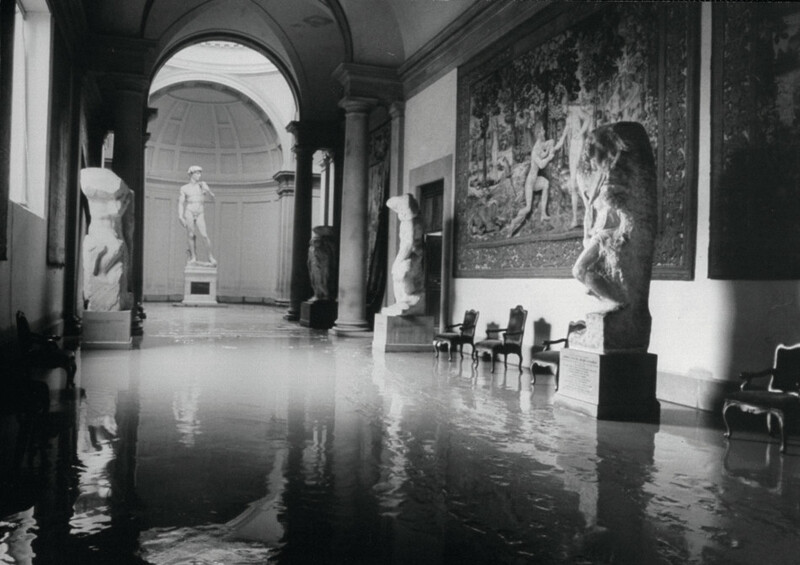 As one of the foremost conservators in the U.S., Don Etherington, wrote in Flood in Florence, 1966: A Fifty-Year Retrospective, “before, people who had some certain technique wanted to hide it; nobody wanted to share. In Florence, talking about our individual techniques was like lifting a curtain.” Techniques were shared, modified, and improved upon. Some of the most commonly-used conservation treatments came out of this experience. For example, phased conservation, freeze-drying wet books, using detailed treatment documentation, mass deacidification, non-adhesive bindings, use of Japanese paper, heat-set tissue, vellum tensioning, and encapsulation. There was also a marked change in attitudes surrounding preservation. Those working in the profession began to call themselves conservators, rather than book restorers, and shifted to minimal, non-invasive procedures, preventative measures, and holistic collection care. Libraries developed disaster preparedness plans and trained staff to know how to respond to floods and mold. Although this is undeniably a success story, it is not actually over. As of November 2016, 50 years after the flood, there were still about 19,000 items from the Magliabechi Collection, 3,500 from the Palatine Collection, and 30,000 miscellaneous items awaiting restoration at the National Central Library. Many items were lost forever, and many of the sculptures and paintings on display in Florence now are actually reproductions, as the originals are either too fragile or too precious to risk again. But there is hope! As the years pass, and new treatments are constantly being innovated and discovered, more things may be restored that were once thought irredeemable. I’ll leave you with a link to a story about a important Renaissance painting, damaged in the floodwaters, that was fully restored only a few years ago using new technologies.